Lord Buddha discovered and teaches that the cause and solution for our happiness and sorrow comes from our own minds. One of the best ways to focus the mind is to retreat from worldly distractions. Historically, many individuals have sought places conducive to solitary meditation. 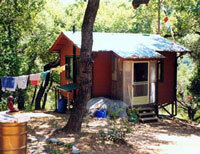 In the West there are very few places that meet the criteria for successful solitary retreat. Land of Shiné – 500 acres at Big Sur on the California Coast – is such a place. Access to the property is by a rugged seven-mile road, a journey that takes over an hour, can only be negotiated by a 4-wheel drive vehicle. For Buddhism to succeed in the West, practitioners must gain profound realizations on the path to enlightenment. These realizations are the result of long-term, isolated retreat. Once realized, this potential becomes an inspiration to all of us who seek refuge in the Buddhist path and wish to benefit others. Lama Zopa Rinpoche and Ribur Rinpoche conclude that this land has special significance for the development of realizations in the minds of students. Isolated from the normal input of everyday life, the real work can begin…. 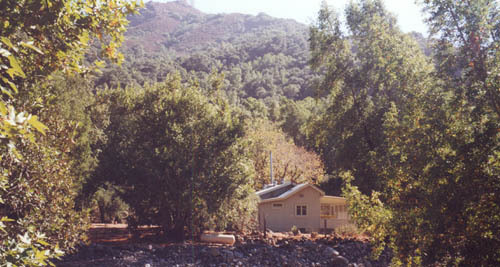 Students require time and resources to undertake retreat. Obstacles to entering retreat can be enormous. The way to clear obstacles and create the cause to enter a successful retreat is to contribute to the success of another. Your donation to Land of Calm Abiding will benefit those on the land and create the cause for your own successful retreat. Please consider supporting the tradition of long retreat in the West by making a donation. Your help directly benefits those long-term meditators on the land, plus contributes to maintenance and development. A donation of any amount means that Land of Calm Abiding can flourish and become a place for more students to gain realizations on the Buddhist path. The meditators on the land make dedications and prayers for those individuals that support their retreat at Land of Calm Abiding. Without this kindness and support, none of them will have the opportunity to gain realizations on the path.